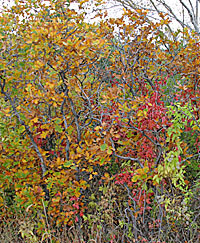 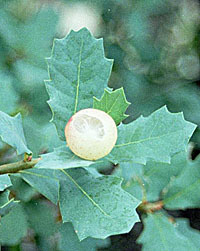 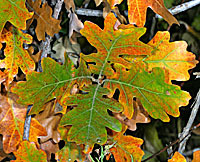 Quercus gambelii, Gambel's Oak, a common scrubby oak. 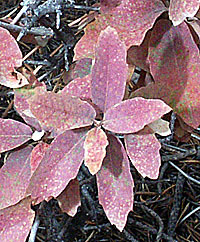 Grows in dense thickets throughout southwestern mountains. 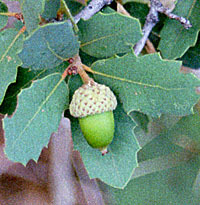 Grey Oak, Quercus grisea, growing in lower Frijoles Canyon, Bandalier National Monument, 5,630 Feet, shaded woods in canyon bottom, August 18, 2007. 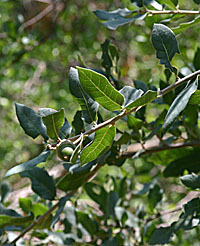 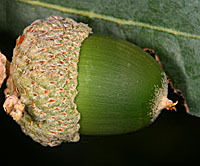 This is a small tree, height 3 meters, leaves alternate length 52 mm, width 24 mm, petiole length 4 mm, acorn length 20 mm, width 15 mm. 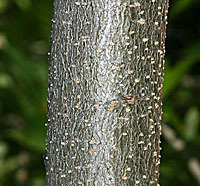 Trunk diameter shown is4 cm. 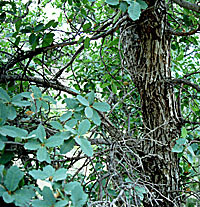 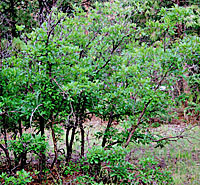 Quercus turbinella, Scrub Live Oak, growing in thickets on the west slopes of White Rock Canyon, Rio Grande River, New Mexico. 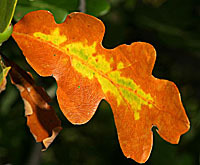 Dry gravelly, east facing sunny slope.